Blowout Sale! Save 51% on the FOXTROT Capsule Lighter with Bullet Reusable Match Striker and Copper Lighter Fluid Canister by FOXTROT at Kerinci. MPN: FOXTROTBULLET101. Hurry! Limited time offer. Offer valid only while supplies last. Introducing the new and improved FOXTROT Survival Capsule Peanut Lighter X2 and bullet shaped matchbox Striker with copper lighter fluid canister. Introducing the new and improved FOXTROT Survival Capsule Peanut Lighter X2 and bullet shaped matchbox Striker with copper lighter fluid canister. This set includes two stainless steel capsule peanut lighters, one zinc alloy refillable, reusable matchbox, and one lighter fluid holding copper canister. The lighters are pleasing to the eye and concealable like no other. The great thing about the FOXTROT lighters and matchbox, are the versatility. All items include the durability needed for outdoor activities and the waterproof capability needed for an active lifestyle. When the capsule lighters are closed, the waterproof stainless steel exterior protects the lighting functions of the lighter. The bullet matchbox provides a sleek design with a smooth zinc alloy finish. It will not rust either, which is important for the longevity of the items. Both matchbox and lighter are completely concealable. The design was to protect and hide away in the smallest of areas. The lighter is 1.87" long by 0.5" wide. The bullet striker is 3" long 0.5" wide and the copper canister is 2.25" long 1" wide. These items are also refillable, just like a zippo lighter. Each capsule slighter comes with a carabiner hook that you can easily attach to your keychain, backpack zipper, or belt loop. These lighters are great for a variety of outdoor activities like hunting, fishing, hiking, backpacking, adventurers, thrill seekers, mountain climbers, camping, travelers, and trail blazers. These items are 100% money back guaranteed and shipped fast from the United States of America!!! What are you waiting for? Get that one item that all of your friends are sure to admire! FUN NOVELTY ITEM - it's not everyday you come across an item that all your friends will love. These lighters can be shared with others too. Makes a great gift for the outdoor lovers. VERSATILE - the FOXTROT lighters can be used in a variety of outdoor activities such as camping, hiking, hunting, fishing, or any adventure you decide to go on. DURABILITY - the materials used for the lighters were specifically built with longevity in mind. 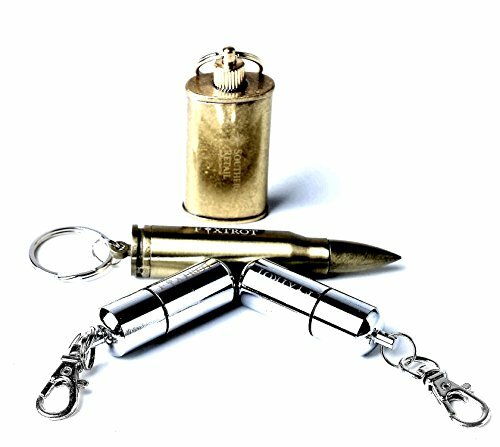 The capsule lighters are built with stainless steel, the bullet shaped matchbox with zinc alloy and the canister is copper.